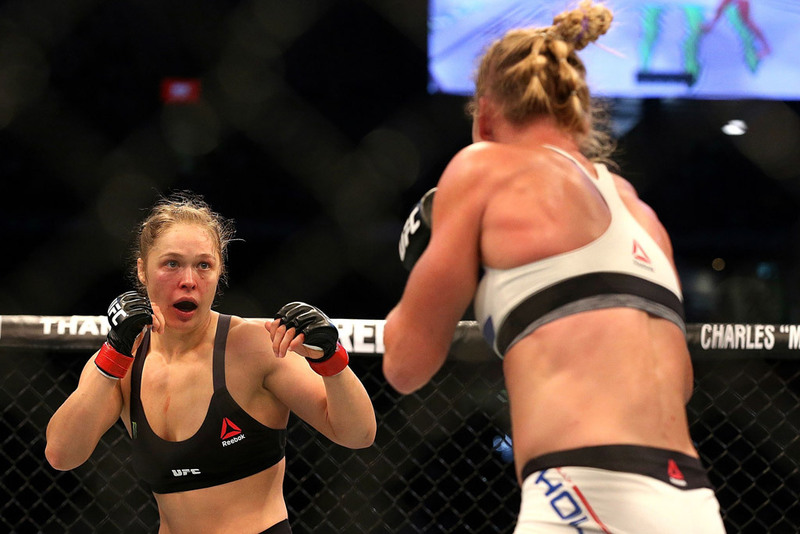 It was Ronda Rousey’s “Mike Tyson” moment. Where Ronda felt invincible like Mike Tyson did on Feb. 10, 1990, in Tokyo, where he faced the little-known Douglas as a 40-1 favorite but was knocked out in one of sport’s biggest upsets. On November 15, 2015, Rousey went up against 34 year old Holly Holm, who’s ranked 33-2-3 as a boxer, holding W.B.A., W.B.C., and many other titles. She then moved into mixed martial arts, where her record improved to 10-0 with the Rousey win. The fight was hosted in Melbourne, Australia, and the result was shocking. Holm, ranked just eighth in their weight class and underwhelming in her two previous Ultimate Fighting Championship bouts. She knocked Rousey out in the second round. Rousey started the fight on the attack, perhaps looking for another quick win. But she found herself chasing Holm around the Octagon, all the time taking hard punches and kicks. She struggled to get Holm on the ground, Even when Rousey began to apply her signature arm-bar, Holm eluded it and continued the barrage. A nasty kick to the head finished Rousey off. Rousey was taken to a hospital to be checked after the fight and did not make a post press conference statement. But in a brief post on Instagram on Monday, she wrote, “I’m going to take a bit of time, but I’ll be back.” Rousey will need to review her tactics and rediscover her motivation. She will win again, and may even be the best again. But she will never again be invincible.